HoSt is specialised in waste to bioenergy or also known as waste-to-energy (WtE) or energy-from-waste (EfW) solutions and supplies proven sludge to energy digestion plants. Municipal wastewater treatment plant (WWTP) sludge treatment is often an energy-consuming waste management headache. 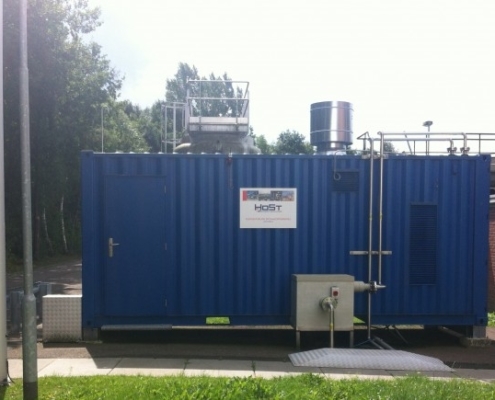 With the sewage sludge treatment systems of HoSt, WWTPs have the potential to turn the plant into an energy provider. To reduce the communal sludge amount and to increase the energy output, HoSt uses a combination of technologies. A combination of a thermophilic digester and a mesophilic after-digester increases the conversion by 25%. Furthermore, Thermal Pressure Hydrolysis can be implemented as a pre-step. This leads to a further increased biogas production by 15%, a reduction of sludge, and an improved dewaterability. By combining a thermophilic digester (55 °C) with a mesophilic digester (40 °C), the biogas yield is improved by more than 25%. Thermophilic digestion means digestion at a higher temperature compared to a conventional, mesophilic digestion process. More heat must be used to heat the sludge, but this leads to an increased biogas production. A patented heat recovery system designed by HoSt ensures that there is a positive energy balance. The goal of a TPH system is to improve the biodegradability of organic material. By using thermal pressure hydrolysis, structures that are normally hard to convert by bacteria, such as lignin in plant material and cells in sludge can be converted. This breakdown step makes the organic matter more available for the bacteria. Because of TPH, this improves the material conversion rate and increases biogas production. Apart from the increased biogas production, the TPH process leads to a reduction of the sludge and an improved dewaterability, which leads to less discharge costs at a WWTP. More info about Thermal Pressure Hydrolysis. The sludge at the WWTP contains valuable raw materials that can be recovered and re-used. One of this materials is Struvite, which can be used in the agriculture as a fertilizer for example. 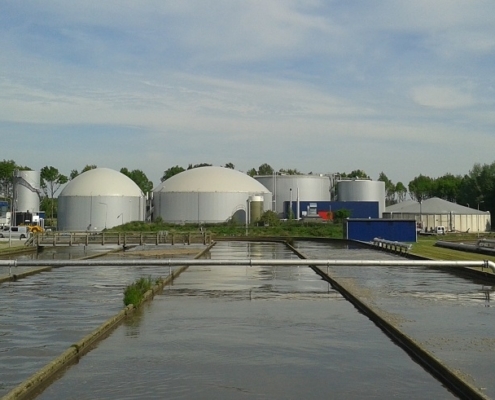 The biogas from the digesters can be used to produce electricity with a CHP-system, or the biogas can be upgraded to biomethane and injected into the gas grid or used as transport fuel (LNG,CNG). Project Echten, built by HoSt, is Netherland’s first system that digests sludge in a thermophilic digester, followed by a mesophilic digester. 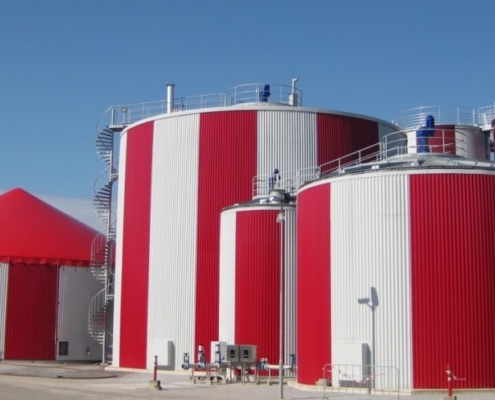 Read more about this project or go to our project page for all sludge biogas plant projects. HoSt has built several biogas plants with sludges as input material. Interested in the possibilities of our sludge treatment technology or would you like to receive advice or more information? Feel free to contact us.